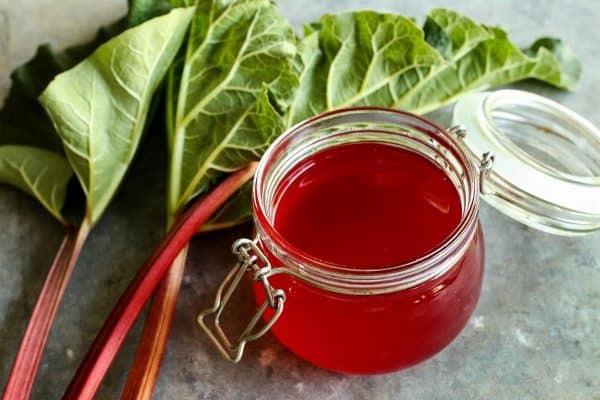 There are so many ways to use Ruby Rhubarb Syrup. Keep it on hand during the spring and summer for topping breakfasts and desserts, and for mixing into cocktails and mocktails! It’s impossible for me to cut rhubarb from our yard without thinking of Mom. As a kid, I thought she was completely nutso for her love of “that weed” growing alongside the garage on the farm. But every year for the last half of my life, my fondness for rhubarb has grown. I divided a large plant a number of years ago, and I do believe it’s time to do it again. Because every year, I find new ways to love it more and more! 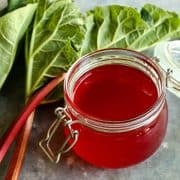 I have been making this Ruby Rhubarb Syrup for many years now. It’s definitely become a spring and summer tradition around here. Read on to see just why! *Here are a few more rhubarb recipes I’m especially loving right now: My family has 100% approved this Rhubarb Sour Cream Coffee Cake. The super crispy topping on this Strawberry Rhubarb Crisp has won many fans…even those who swear they don’t like rhubarb! And the delicious nostalgia of my grandma’s Rhubarb Custard Pie will always hold a special place in my heart. 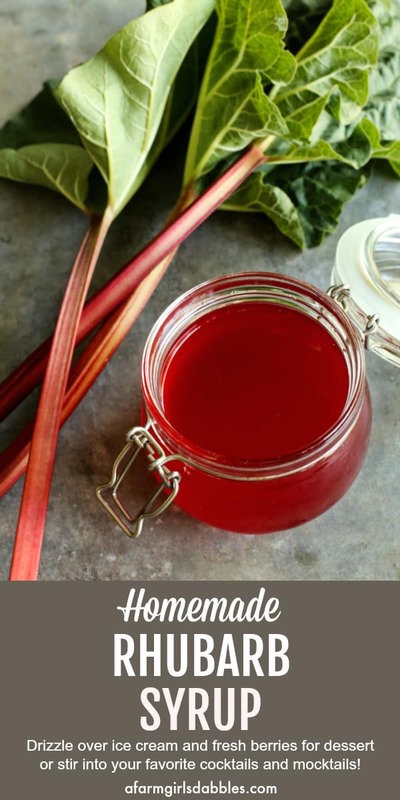 I love the simplicity of this rhubarb syrup recipe. All it takes is some chopped rhubarb, water, sugar, and fresh lemon juice. Soften the rhubarb in a pan with some water on the stovetop. Then strain it to remove the pulp. Add the sugar and bring the mixture to a boil to thicken a bit and intensify the flavor. At this point, the kitchen is smelling softly sweet, so very lovely. 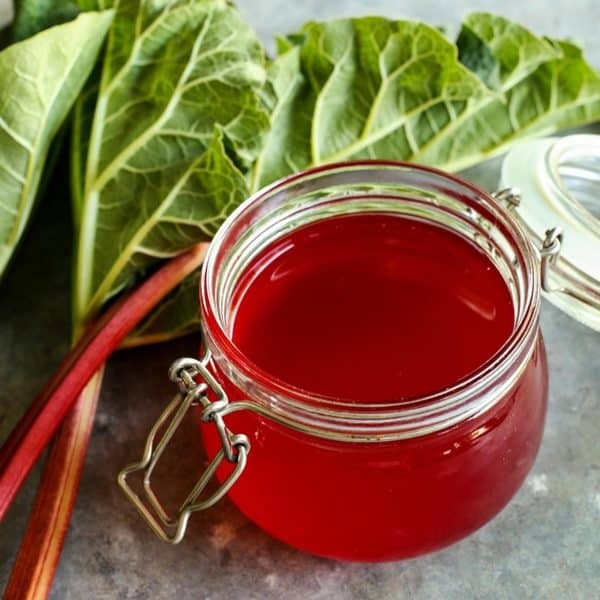 The possibilities for how to use this rhubarb simple syrup are nearly endless.. 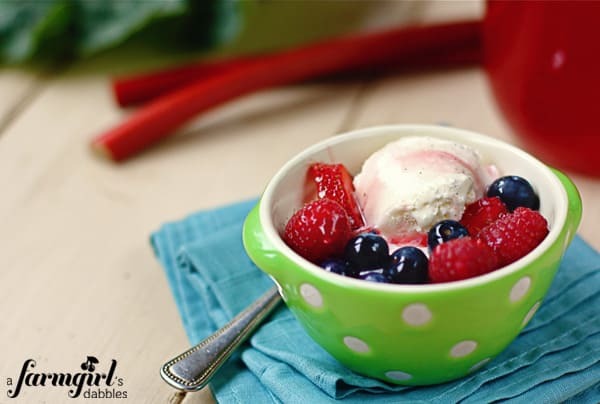 I am always experimenting, but one of the very best ways is to drizzle it over vanilla ice cream and fresh berries. The rhubarb syrup is also great over waffles, pancakes, and French toast. And cocktails and mocktails beg for a little bit of rhubarb’s seasonal awesomeness. 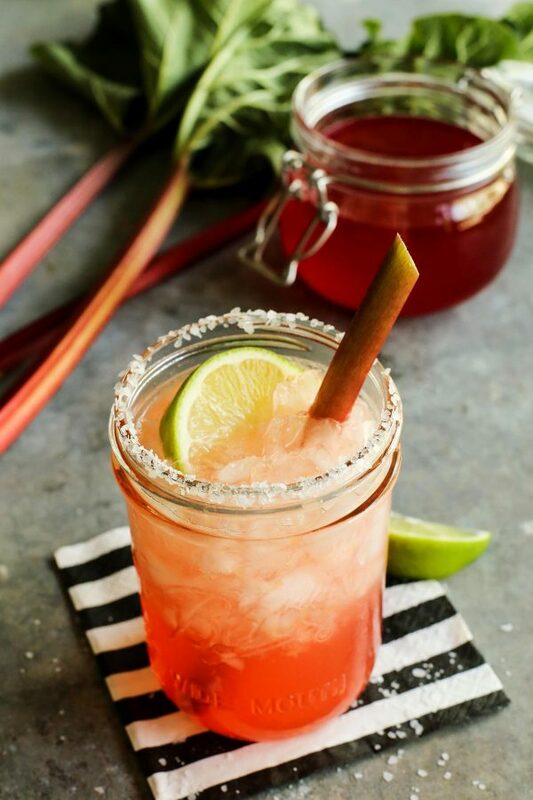 A couple of my favorites are the Rhubarb Margarita and the Rhubarb Mojito. These two beverages have been so fun to serve when we entertain during the spring and summer. When our mint is flourishing, the mojito is a wonderful way to enjoy its bounty. For a non-alcoholic beverage, we like to pour some of the syrup over ice in a glass and then top it off with club soda. Or pour a bit into some lemonade. Super fun! *Here are a few recipes I’d like to try: Rhubarb Strawberry Smoothie from She Wears Many Hats and Rhubarb Sherbet from Pint Sized Baker. And doesn’t this Rhubarb Fool from Boulder Locavore look wonderful? In a medium saucepan over medium-high heat, bring the rhubarb and water to a boil. Lower the heat to medium-low, cover, and cook the rhubarb until it is tender, about 10 minutes. Stir to break up and release all of its juices. Set a fine mesh strainer lined with a double layer of cheesecloth over a large bowl. Pour the rhubarb mixture through the strainer to remove the pulp. 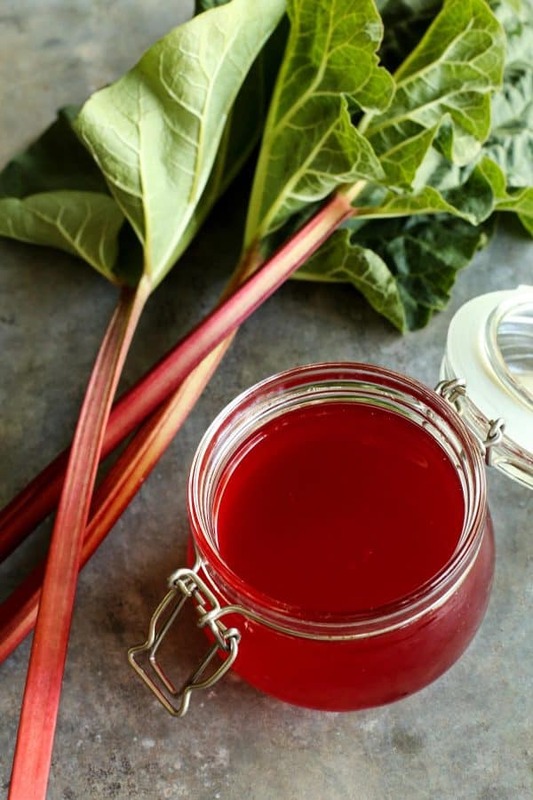 To get the most rhubarb juice out, pull up the corners of the cheesecloth and gently press on it with a wooden spoon to squeeze out the remaining juice. Measure the strained juice and add enough water to equal 3 cups. Return the liquid to the saucepan over medium-high heat and stir in the sugar. Bring to a boil and cook until the sugar dissolves, about 8 minutes. Remove from the heat, stir in the lemon juice, and let cool. Strain again for the clearest ruby syrup, then pour into a container and refrigerate. Keeps well for up to 1 month.